The U.S. Secretary of State, Michael Pompeo addresses the Iranian American community outlining the US policy on Iran. 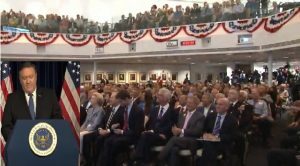 On Sunday, July 22, 2018, U.S. Secretary of State Mike Pompeo addressed a large group of Iranian American citizens at the Ronald Reagan Presidential Foundation and Library in a speech aimed at supporting Iranian voices. ” Indeed, our European allies are not immune to the threat of the regime by terrorism. At the same time [the Iranian regime officials]are trying to convince Europe to stay in the nuclear deal, they are covertly plotting terrorist attacks in the heart of Europe,” emphasized Secretary Pompeo. On June 30th, a Belgian couple of Iranian heritage was arrested with explosives and arrested for attempting to bomb the annual Grand Gathering of the Iranian Resistance in Paris. An Iranian diplomat was arrested in Germany for masterminding the attack. Secretary Pompeo tweeted about this story as well, urging all of the Iranian regime’s diplomats to be expelled. 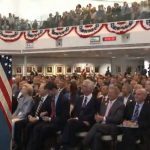 Secretary Pompeo’s speech on Sunday was an extension of the previous support he has shown for the Iranian protesters and their struggle for change and a free Iran. The Trump Administration withdrew from the Iran nuclear deal earlier this year and will reimpose sanctions in September, ending the U.S. policy of appeasement with the mullahs. The regime is well-known for its smear campaign to demonize, discredit, and violently discredit the MEK, the largest opposition to its clerical regime. Secretary Pompeo said: “The level of corruption and wealth among regime leaders shows that Iran is run by something that resembles the mafia more than a government. Secretary Pompeo referring to the uprising that has been taking place among the people of Iran since December 2017, and the regime’s attempt to violently suppress protesters, said: “Since December Iranians have been taking to the streets in the most enduring and forceful protests since 1979. Some shout the slogan “the people are impoverished while the Mullahs live like Gods!” while others choose to shut down the Grand Bazaar in Tehran.